Looking at a map of the Isle of Dogs pubs that have now closed is depressing. The cluster of boozers at the north end of the Isle of Dogs, closest to Canary Wharf, have mostly gone since the gleaming towers of London's new financial district opened; replaced by towering apartment blocks to house the office staff that replaced the dockers. 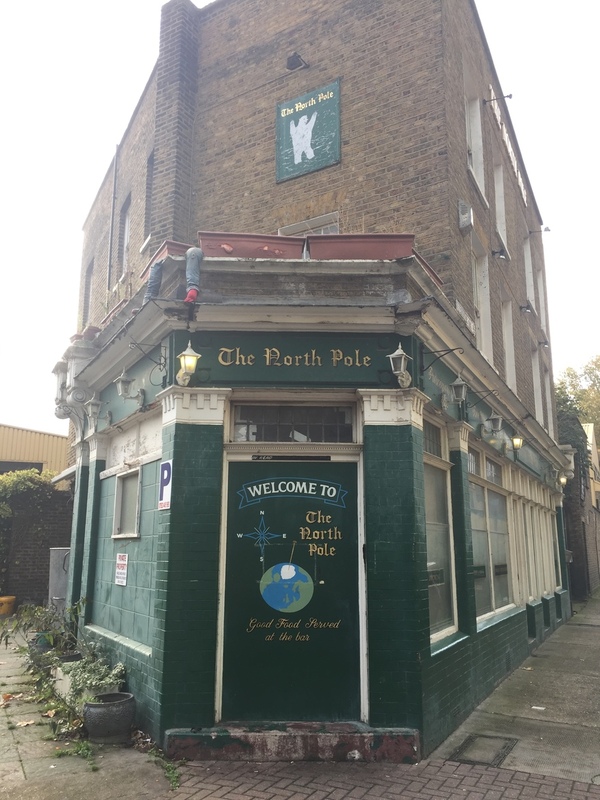 It's at this end, closest to South Dock, that The North Pole offered a haven – an authentic escape from the plastic eateries and bars, where you could be assured of a warm welcome, affordable pub grub (something and chips), and a pint. Now, the pretty green-and-gold lettering on the front of this three-storey building are fading as iceberg-like new skyscrapers grow up around it; monoliths heralding the changing nature of work in this part of east London. Just round the corner, all that remains of the Anchor and Hope are the burnt caramel glazed tiles. After 176 years of serving pints to islanders and visitors, it finally closed in 2005. 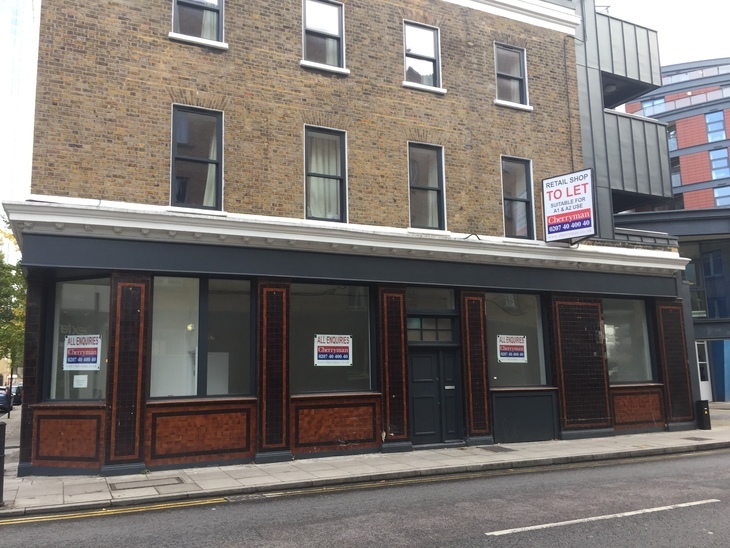 It stood empty until 2014, when the pub's accommodation was turned into flats, while the pub interior was converted into office space; empty on our visit. The brown and black tiles are all there is to remind us of the Anchor and Hope pub. The story doesn't get much better as you go down Westferry Road. The Kingsbridge Arms, Magnet and Dewdrop, the Vulcan and many more have closed since Canary Wharf opened. But all is not lost – there are still some gems to be found among the sterile apartment buildings and mixed local authority blocks. The Ferry House - the oldest pub on the Isle of Dogs. 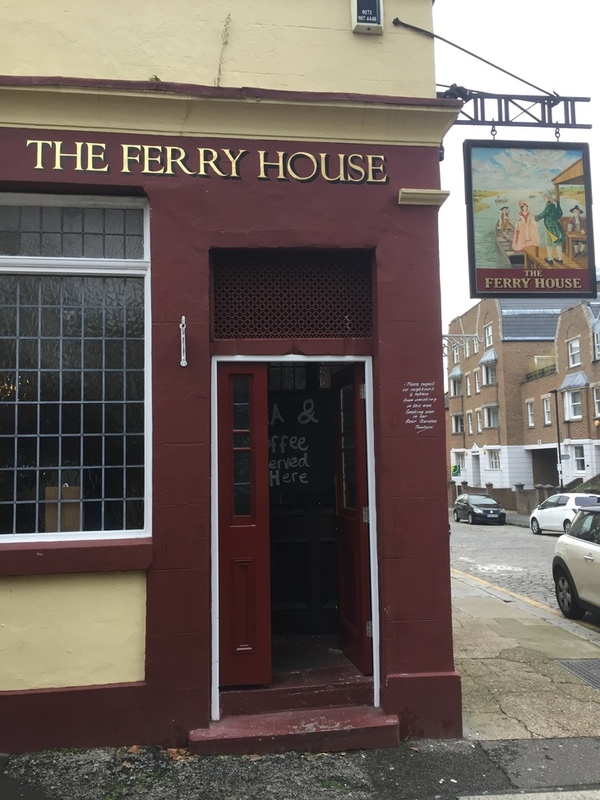 Right at the southern tip, with views across to Greenwich, is the Ferry House, a cosy wood-panelled pub with a crackling fire. "Apparently Samuel Pepys used to drink in here," says Lauren Morley, who's pouring pints for the handful of regulars sitting at the bar. She hands us a pub history book from which we learn there's been a pub on the site since Tudor times, although its present incarnation was built in 1822 as a home for the ferryman — his wife would serve pints as people waited for the free ferry to take them to Greenwich. This never-profitable service closed in 1899, killed off by the opening of the Blackwall Tunnel in 1897, and the Greenwich foot tunnel (work started in 1899). Proudly boasting the title of the oldest pub on the island, it's survived the bombing raids of the second world war, the closure of the docks and is now adapting to a new challenge — the demographic changes on the island. "We're opening an Indian restaurant upstairs," says Lauren, proudly. "Did you know that most of the dishes in Indian restaurants are Bengali? Well, we’re going to be doing proper Punjabi cuisine. There's lots of Asian people living here now and they don't really drink in pubs so we're hoping to bring them in for the food upstairs. 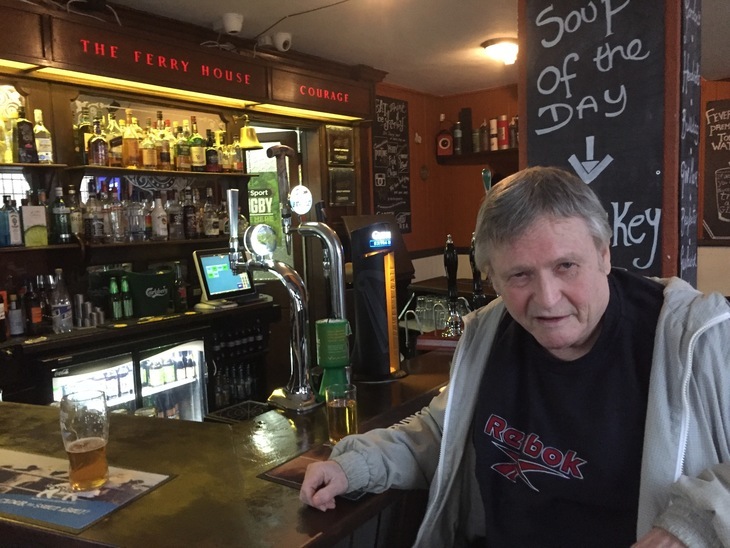 "But if you really want to know about the pubs round here, you should talk to Mick," she smiles, pointing to the bar, and going over to where sprightly 78-year-old Mick Clark sits. Former dock worker, Mick Clark. "All the pubs, all the industry here's gone now," he laments. "You could lose a job in the morning and get another by the afternoon," he remembers, before popping back to his nearby home to dig out photos of him working as a docker in the 60s. With a sharp wit, he cackles as he remembers some of the nicknames from the docks. "There was one guy we used to call Judy Garland because there used to be a pub called the Rainbow, and when we asked him where he lived, he said 'over the Rainbow'." Mick, born in Stepney, moved to the island with his parents. "I like it here because they have nice barmaids," he grins and winks at Laura, who admonishes him fondly for his cheek. We've interrupted a conversation between Mick and Dave O'Toole, who worked at Billingsgate Market ("oh, you know Terry The Fish?" asks Mick). "I come here because my friends drink in here, and it's a nice place to come and meet up with your mates," he says. "I used to drink in lots of the other pubs here too – you'd go different places on different days; but most of them have shut now. "I think it's sad the pubs have closed. My dad always said this is where jobs were found. But the price of drink has gone up so much because of rents, taxes and the breweries. "Prices have got ridiculous. There's a pub up the road that does pie and mash. I watched them put up the prices to £9.50 and I told them I could call up Maureen's Pie and Mash shop up Chrisp Street, and get a black cab to bring it over for less than that." Speaking of which. Mick and Dave turn to greet Bill Newson, who's just walked in. As Laura pours him a pint, the black cab driver, who was born on the island, tells us how he's seen the area change. "The sense of community has gone round here. But there's better transport links. There used to be one bus a day — when I was doing my apprenticeship it used to be quicker on Sundays to walk to Mile End than wait for the bus. Black cab driver Bill Newson. "There's only a few pubs left. There used to be 20 when I was younger. When the Island Carnival was on there'd be a pram race — two of you would be a team and you'd take it in turns to have a half in every pub, racing between them in a pram. "All the work has gone to Canary Wharf, and there's wine bars there, where the younger generation prefer to drink." As the three reminisce about the days when the docks were thriving, all of them laugh as they remember a doctor who would prop up the bar every day. The dockers could come in and he'd write them a sick note in exchange for a large whisky. "He'd write them at the bar," grins Mick. 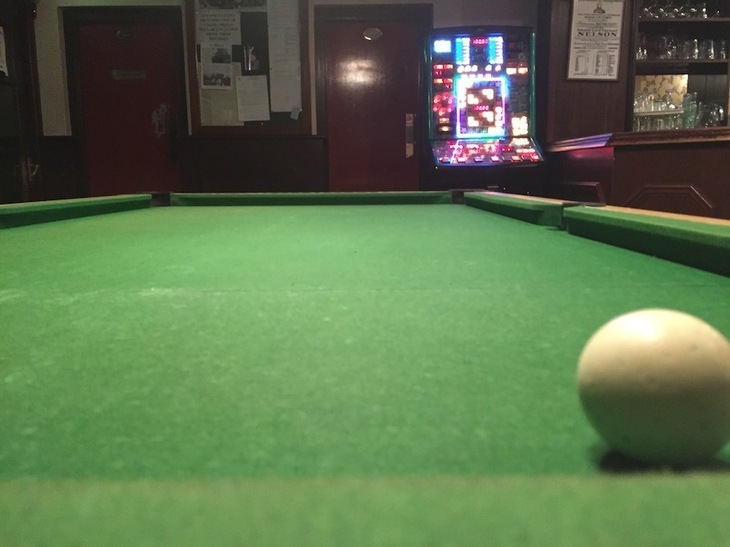 The pool table in the Lord Nelson. With its warm welcome and roaring fire, it's hard to tear yourself away from a place like this, but with more stories ringing in our ears, we head a few hundred metres up to the Lord Nelson. Considerably larger than the Ferry House, the Nelson was originally built as a grand pub, in contrast to the former Victorian beer houses that used to serve the dockers. It's lost some of the glamour of its glory days, but paintings of the great sailor after which its named still adorn the walls. At the back is a pool table, with a standard dartboard nearby. On the other side of the pub is an East End Fives board – a rarity these days. 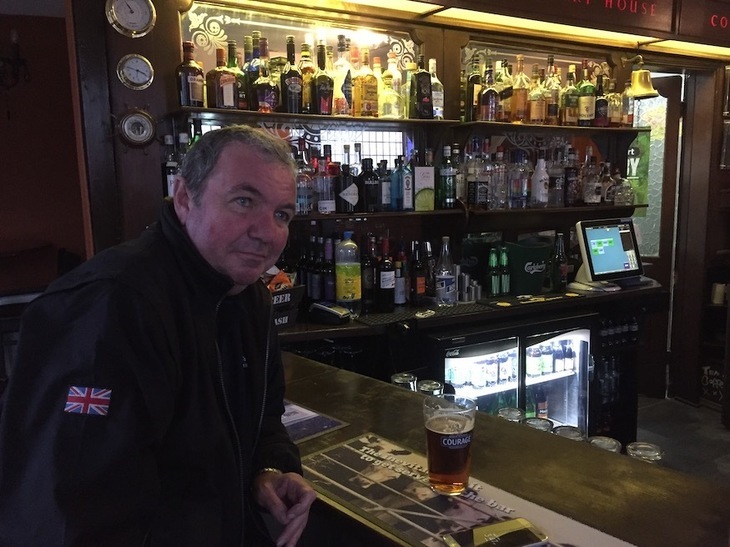 "There used to be 43 pubs on the island, now there's only six," says Nigel Green, who's been working here for 20 years. "A lot of the people who live here now don't drink in pubs. They either don't drink, or they go to the supermarkets and drink at home. Look at Marathon day – it goes right past here, but you see crowds of people with boxes of beers from Asda." 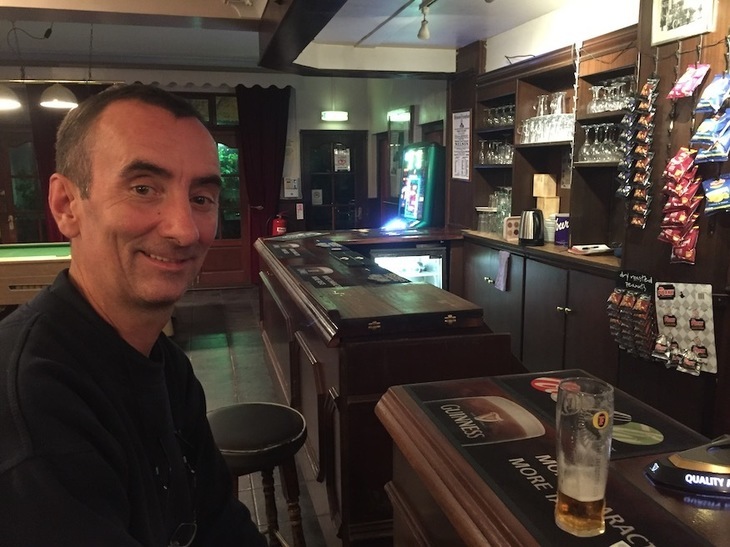 Sat at the bar is Chris Steele, who has lived on the Isle of Dogs since 1991, and was one of the builders on Canary Wharf. "Nobody goes out to drink any more – it's too expensive," he says. "You can get 20 cans from Asda for £12, which will get you about two-and-a-half pints in here. It’s a no-brainer, especially when you're short of money." 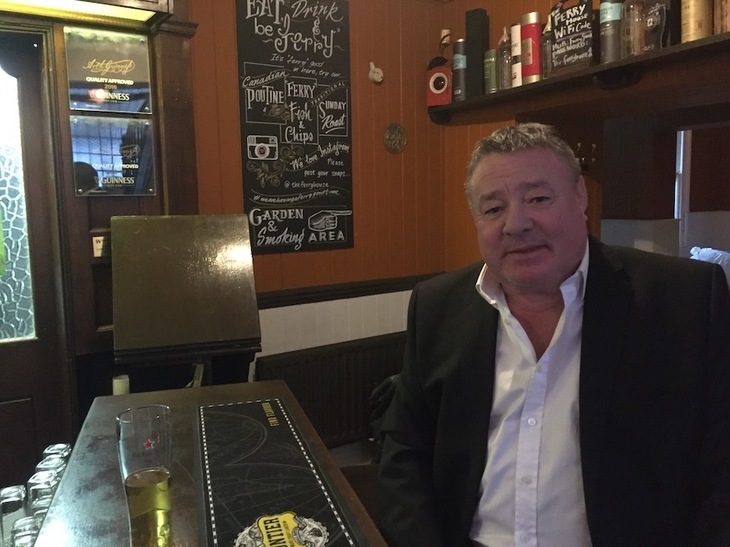 Like the others, he regrets the sense of community that's lost as people no longer go to pubs, and as the changing nature of work means people don't often put down roots in an area. We say our goodbyes and Chris and Nigel turn to the quiz machine. Heading up to the George we find it temporarily closed – not due to economics though; a note on the door tells us technical difficulties mean it can't open today, but will be pouring pints again tomorrow. 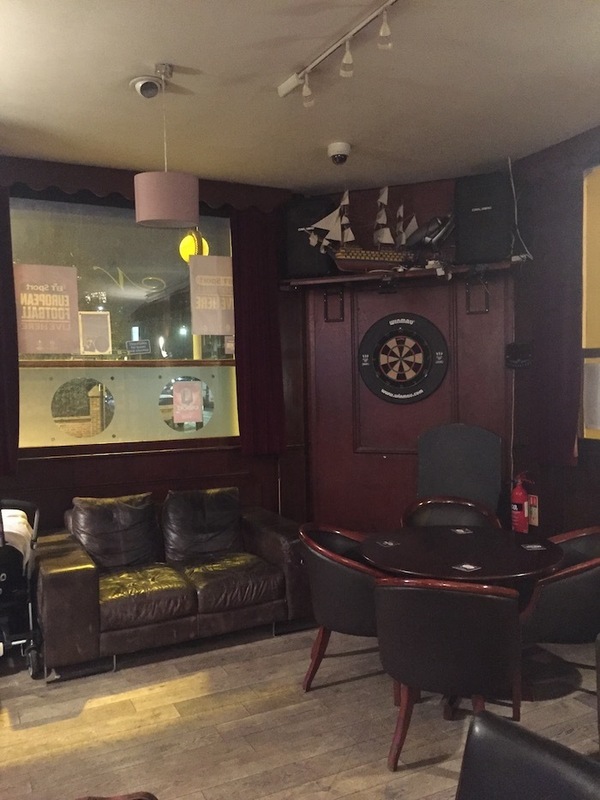 The East End Fives dartboard in the Lord Nelson. So it's a quick nip over to Millwall Dock, the bright lights of the apartments and offices sparkling off the water, to Antic-owned Pepper Saint Ontiod. With huddles of young professionals and the smell of mulled something in the air, this is a very different place to the boozers we've just come from. It's an appropriate end to our trip: the traditional working class values of community, loyalty and 'regulars' feel a world away from the transience of today's working culture. Just like their own frequently-changing jobs, office staff rarely keep loyalty to one boozer; and when they get home they'll pick up a bottle of wine or some cans from the supermarket and sit on the sofa to drink with dinner. We'll be back, though, just like Mick, Dave, Bill, Chris and the other regulars – that is, for as long as the breweries hold out against the financial pressures of London's property prices. There's an excellent and comprehensive list of pubs, with photos on the Isle of Dogs - Past Life, Past Lives blog.